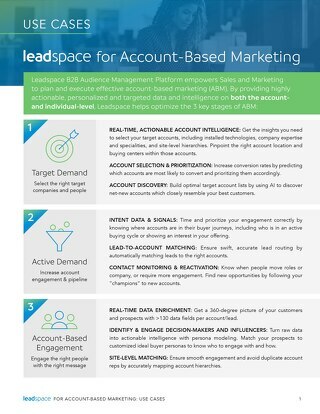 Learn how Leadspace enables Account-Based Marketing (ABM) at B2B organizations, and helps Sales and Marketing teams excel together at ABM campaigns. 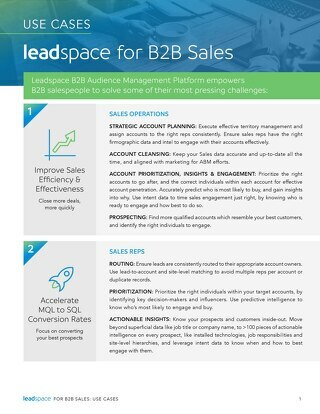 Leadspace Audience Management Platform helps B2B Sales solve some of their most pressing challenges, including improving sales efficiency and effectiveness, and closing more, larger deals. 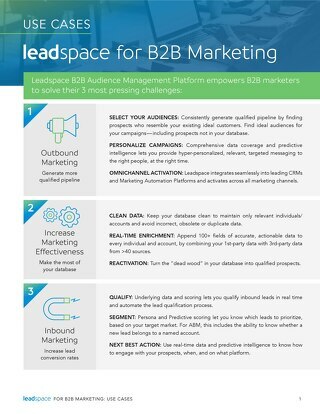 Leadspace Audience Management Platform helps B2B marketers generate more qualified pipeline, make the most of their databases to maximize engagement, and increase conversion rates. Gartner does not endorse any vendor, product or service depicted in its research publications, and does not advise technology users to select only those vendors with the highest ratings or other designation. Gartner research publications consist of the opinions of Gartner's research organizations and should not be construed as statements of fact. Gartner disclaims all warranties, expressed or implied, with respect to this research, including any warranties of merchantability or fitness for a particular purpose.